This is a 12 inch fully jointed North American Exclusive teddy bear..
It´s Springtime, and the air is humming with new life. The birds are singing, the flowers are blooming, and Steiff is introducing a delightful way to celebrate the arrival of the season. 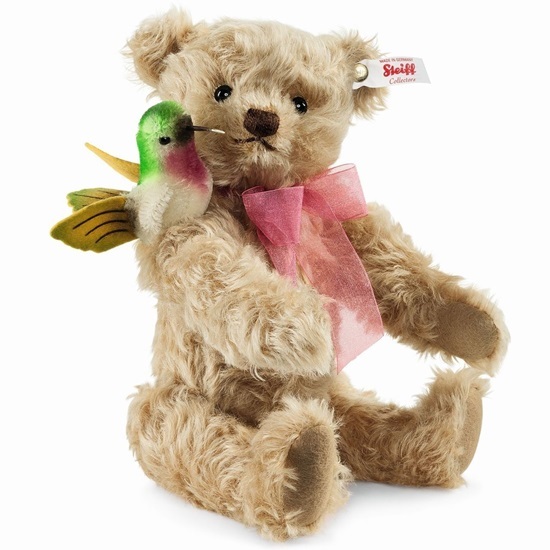 Presenting "Humming Along" - a fresh and fabulous addition to the Steiff collection for 2015.Sewn from unique light brown mohair, "Humming Along" is a gorgeous Teddy bear accented by an intricately handmade hummingbird and a pink organza ribbon. It´s sure to put a smile on your face and a song in your heart. "Humming Along" is 5 way jointed, with black safety eyes, and a hand stitched nose and mouth. She is surface washable and comes with the white tag "Button in Ear".